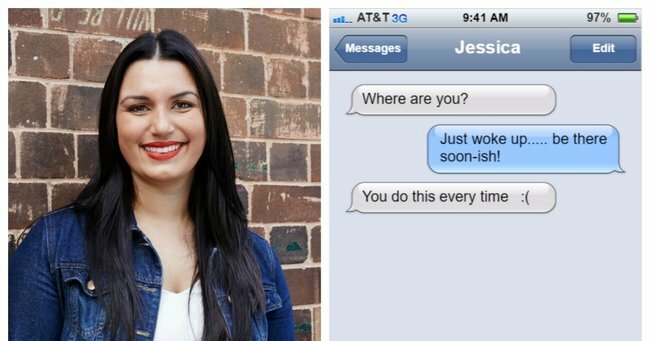 The busy gal's guide to saving time in the morning. The busy woman’s guide to getting ready in less than 30 mins. When it comes to running late, for the majority of my life, I’ve been a repeat offender. Whether it be university, catching up with friends or even work, I became known as the ‘late and flakey’ person amongst my family, friends, colleagues and acquaintances which isn’t a great title to hold. At one point, my lateness was so rampant that my friends devised a trick. When they would text me to ask how far off I was, they would add an hour to any meeting time I gave them. That way they wouldn’t be forced to wait around for me. They had officially cottoned onto my ways. I knew it was time to tighten up my getting ready routine so I could transition from ‘late and flakey’ person to ‘on-time and reliable’ person. After all, every one of us leads incredibly busy lives so I discovered that a short cut here and there can make the world of difference. I’ve discovered the more you can do the night before, the better it will be for you the next day, especially when it comes to preparing food. Packing your lunch the night before can shave an easy 10 to 15 minutes from your routine the following day. If you want to go all the way and fully commit to being organised, pre-prep all your lunches on a Sunday night for the week ahead. Bag them up individually and store them in the fridge. You can throw them in your bag as you’re running out the door. Not only are you saving time, you’re saving cash if you frequently buy your lunch out. You can also see exactly what’s going into the food you’re making so it’s likely to be more nutritious. It’s a triple win. 2. Don’t make breakfast too intricate or eat on the go. Who has time for bacon and eggs in the morning unless it’s a lazy Sunday? The correct answer is no one. My go-to breakfast is usually cereal because it’s quick and easy. In the colder months (ie. now), I’ll make myself a bowl of porridge with honey. 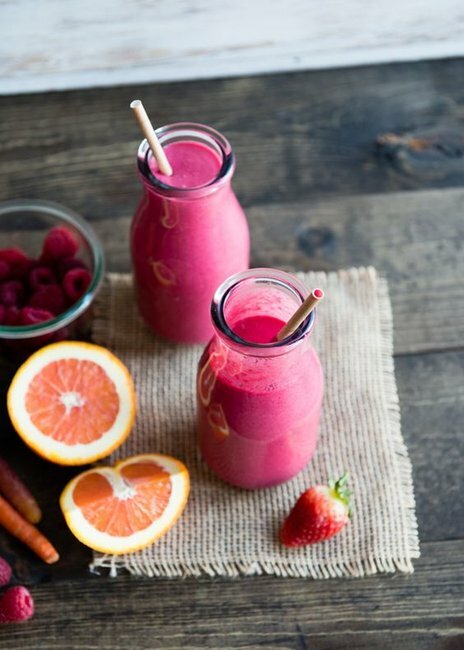 It only takes a couple of minutes and you can eat it f-a-s-t.
Another great option is having your breakfast on the go by making a smoothie. 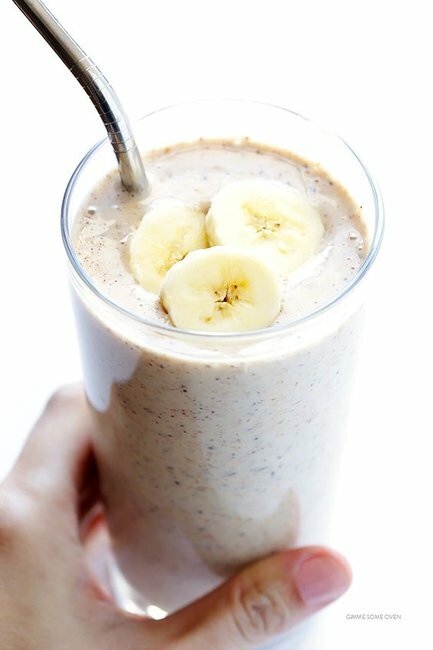 Throw all of your favourite ingredients in the blender, and voila! A yummy breakfast that you can sip while you walk or drive is in the palm of your hands. Too simple. 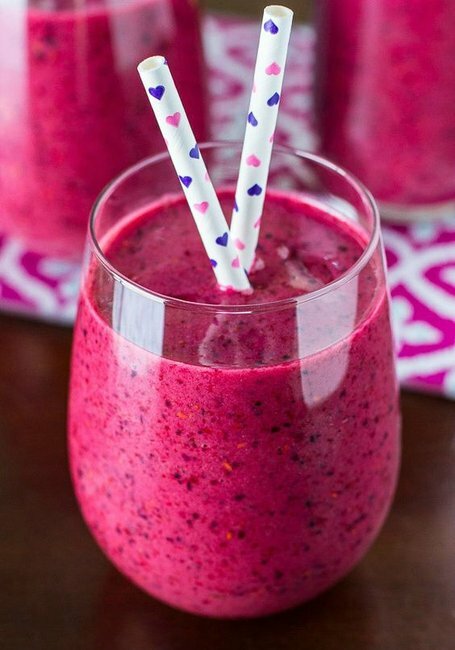 Try brekkie on the go with a smoothie. Image: iStock. 3. Streamline your makeup routine. I don’t know about you but the biggest drain on my time is doing my makeup because winged liner equals effort. But fear not because I’ve managed to get my makeup routine down to FIVE MINUTES. I kid you not and it has changed my life. My biggest tip is replacing foundation with tinted moisturiser. That way, you’re applying your coverage and moisturiser all in one go. If you want to go for a more made up look, add powder on top to set it. You can also swipe over a bit of bronzer and some blush on your cheeks to give yourself that sun-kissed look. I’ve completely ditched eyeliner all together and instead layer on a few generous coats of mascara. A bold lip can also do wonders, and if you go for a matte liquid lip colour, you can glide it on with minimal effort. No fussing around with lipsticks and trying to get it perfect. 4. Wash your hair on a cycle. While it can look lovely to have freshly cleaned hair on a daily basis let’s all get real, nobody – and I mean NOBODY – has time for that. Washing your hair on a cycle is an easy way to take time out of getting ready and it’s also better for your hair because washing less frequently doesn’t strip it of its natural oils. I usually wash my hair every four days, and sometimes I can get it go to five. I’ll always wash my hair and the night before to save myself time the following day. I dry and straighten it so the following day is just a quick glide over with the hair straightener. I can wear it down for two days before I transition across to my ‘dirty hair’ up styles as I like to call them for the next couple of days. Wash your hair on a cycle and embrace the bun. Image: iStock. 5. Learn some simple yet stylish up-dos. Learning how to make dirty hair look good is a time saving art. My most favoured style is usually the slick pony. It’s perfect for two-day old hair because you can get the pony nice and sleek using a bristle brush. If you want to make to go a bit fancy you can take a strip of hair and wrap it around your hair band, then secure with a bobby pin. I also love myself a good messy bun. Start with a pony then take your hair and wrap it around a few times before securing with another hair band. If you want to give your bun more volume use a doughnut and secure with a hair band before using bobby pins to tidy the ends. Braiding is also very trendy at the moment, and can only take a couple of minutes if you master it correctly. You can do a simple low braid by parting your hair in the middle pulling it back and braiding the remainder of your pony tail. 6. Take full advantage of time-saving products. When I say time-saving products I’m talking dry shampoo and baby wipes. They can take any routine and make it two times faster so you don’t have to miss out. Dry shampoo is a great way to get some extra life out of your hair if you want to wear it down for another day by spraying it on your roots. If you’re really short of time and want to save minutes on your skincare routine in the morning, swipe a baby wipe over your face to freshen up before doing your makeup. 7. Decide on what you will wear the night before. I know I’m not the only one who has stood in front of my wardrobe with five minutes left to get out the door and I have NO idea what I’m going to wear. Planning your outfit the night before will not only save you time but it will save you frustration. Plan out in your head what you would like to wear and stick to it. If you want to go the next step further, try laying out all of your clothes the night before. That way you can just quickly throw them on and you’re not taken by surprise if your clothing requires some last minute ironing. Using these simple yet effective tricks I’ve managed to shed my ‘late and flakey’ title and I’m now a fully-fledged ‘on-time and reliable’ person. Woohoo! In our busy lives every minute matters and I’ve made sure to spend that newly gained time with the people I care about. 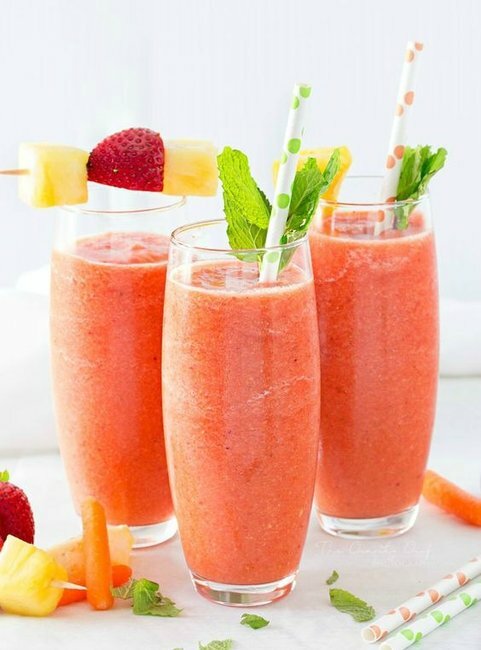 Pink Sunrise Smoothie.10 Minutes. Serves 2. 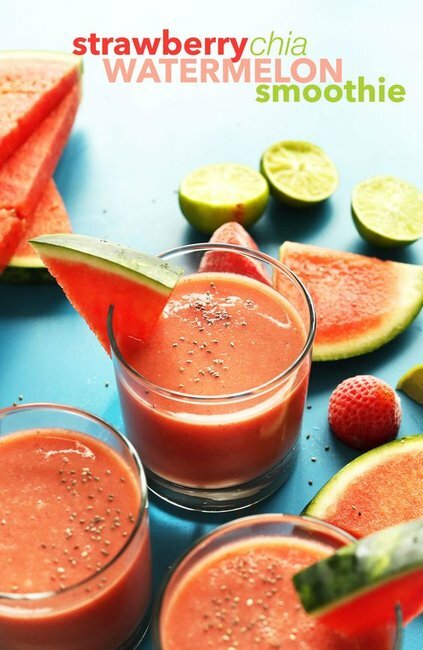 Strawberry Chia Watermelon Smoothie.5 MInutes. Serves 2. 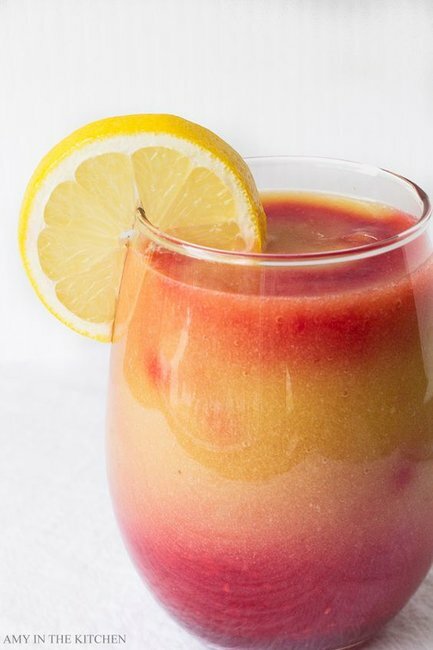 Sunrise Detox Smoothie.5 Minutes. Serves 1. 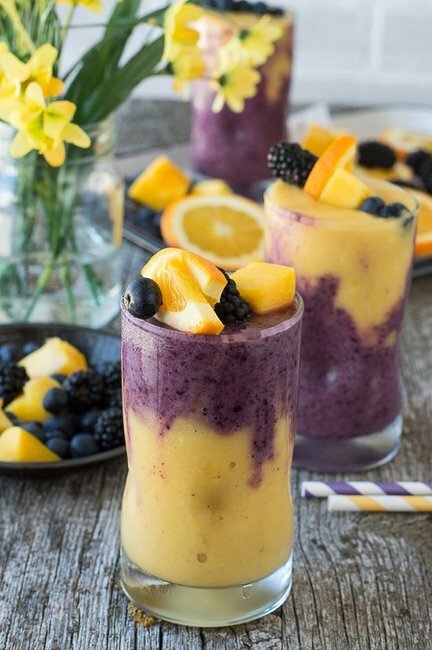 Breakfast Energy Smoothie.5 Minutes. Serves 2. 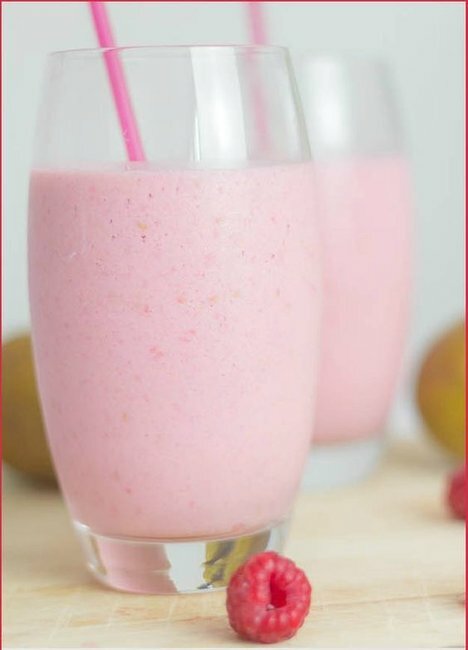 Pear and Raspberry Smoothie.10 Minutes. Serves 2. 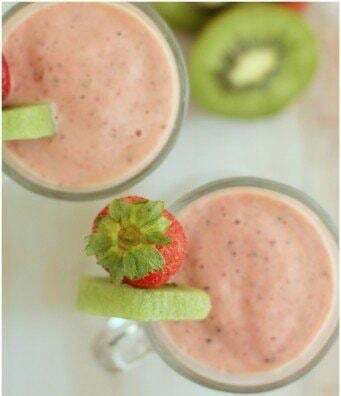 Strawberry and Kiwi Smoothie.5 Minutes. Serves 2. 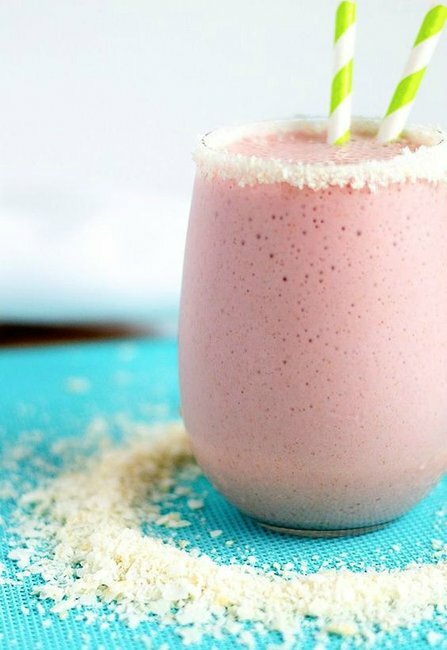 Strawberry Coconut Protein Smoothie.5 Minutes. Serves 1.